(Phys.org)—AgResearch Institute scientists in New Zealand have bred the first cow in the world to produce high protein milk that may be hypo-allergenic. The work by scientists at AgResearch's Ruakura campus has been published in the current edition of the prestigious American science journal Proceedings of the National Academy of Sciences (PNAS). The AgResearch team, led by Dr Goetz Laible, wanted to discover if they could produce milk which contained less of a particular milk protein known to be allergenic. "We were successful in greatly reducing the amount of beta-lactoglobulin (BLG), a milk whey protein which is not in human breast milk and which can cause allergic reactions," says Dr Stefan Wagner, one of the lead authors on the paper. "Two to three percent of infants are allergic to cow's milk, and BLG allergies make up a large part of that percentage." The scientists first tested the process in a mouse model engineered to produce the sheep form of BLG protein in mouse milk. Employing a technique called RNA interference, two microRNAs (short ribonucleic acid molecules) were then introduced into the mouse to knock-down the expression of the sheep BLG protein. This resulted in a 96 percent reduction in the sheep BLG protein in mouse milk. 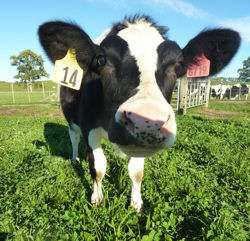 They next produced Daisy, a female calf that was genetically engineered to express the same two micro RNAs, this time to target the BLG protein that is also a normal constituent in cow's milk. They then hormonally induced Daisy to lactate. The resulting milk collected from Daisy had no detectable BLG protein and, unexpectedly, also had more than twice the level of the casein proteins that also normally occur in cow's milk. "People have long looked into reducing this enigmatic protein, or completely knocking it out, because there has been no definitive function able to be assigned to it. So, we developed this scientific model to investigate the effect of knocking BLG protein out on the composition and functional properties of milk, and to determine whether the absence of BLG produces cow's milk that is hypo-allergenic," says Dr Wagner. "This is the real discovery component to this project, and Daisy provides us with the opportunity to answer a lot of those questions. "To avoid the delay of two years before a natural lactation, the milk we analysed was from an induced lactation. We only obtained small quantities over a few days for these initial studies. We now want to breed from Daisy and determine the milk composition and yield from a natural lactation. We also want to investigate the origin of Daisy's taillessness, a rare congenital disease in cows." Malaghan Institute Director Prof. Graham le Gros says "This outstanding breakthrough has enormous implications due to its potential to reduce the significant impact milk allergies have on our children and neatly avoids the concerns associated with genetic modification of the milk proteins themselves." Dr Wagner says in future, the basic process of using designer microRNAs to target other genes could provide an efficient tool to change additional livestock traits, for example to produce animals with enhanced disease resistance and/or improved lactation performance.